Graphene, a two-dimensional lattice of carbon atoms, has attracted enormous interest from a broad base of the research community for more than one decade. Graphene nanoribbons (GNRs), narrow strips of graphene, being quasi one-dimensional, possess complementary features relative to their two-dimensional counterpart of graphene sheets. Based on theoretical calculations, GNRs' electrical properties can be controlled by the width and edge configuration and they can vary from being metallic to semiconducting. The physical properties of the GNRs depend significantly on the size and number of layers, which in turn depend on their synthesis method. There are three major approaches for synthesis of GNRs: cutting graphene by different lithographic techniques; bottom-up synthesis from polycyclic molecules; and unzipping of carbon nanotubes (CNTs). While the bottom-up method provides a route to precise edge control, and the lithographic method can afford GNRs with precise placement, the unzipping method has the advantage of mass-production on a large scale. MWCNT unzipping methods can be classified into four major types: the reductive-intercalation-assisted approach, the oxidative unzipping, the electrochemical unzipping, and the group of methods that can be denoted as miscellaneous. The first approach is based on the well-known ability of alkali metals to intercalate graphite with expansion in the Z-axis direction. Being applied toward MWCNTs, such lattice expansion induces extreme stress within the concentric walls, resulted in the bursting, or longitudinal opening, of the tubes. The resulted GNRs are highly conductive, but they remain multi-layered and foliated. Due to the attraction between the surfaces, they do not exfoliate to single-layer ribbons. The oxidative approach involves treatment of MWCNTs in acidic oxidative media with the formulation almost identical to that used in production of graphene oxide (GO) from graphite by the Hummers method. The resulting product is graphene oxide nanoribbons (GONRs). Unlike GNRs obtained by the reductive-intercalation method, GONRs easily exfoliate in aqueous solution, and they can be obtained as single-layered structures. A reaction mechanism for oxidative unzipping was proposed by Kosynkin et al.1 Invoking the classical oxidation of the alkenes by permanganate in acids, the first step is the formation of manganate ester on a C-C bond, and the second step is the rupture of the C-C bond with formation of ketones at the newly formed edges. This mechanism was further developed in the theoretical work by Rangel et al.2 The original synthesis spawned numerous studies on oxidative unzipping of MWCNTs. 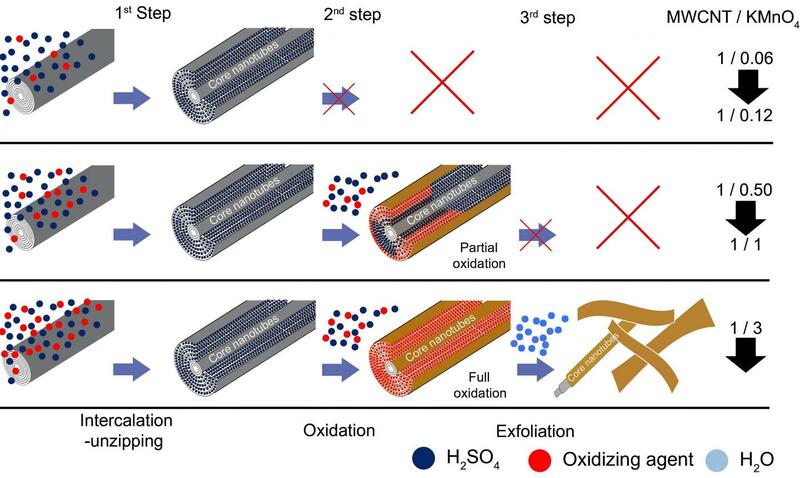 In many reports, the unzipping process was denoted as "chemical" as opposed to the "intercalation-exfoliation", indicating that the permanganate-induced oxidative mechanism has been commonly accepted, and was even suggested toward unzipping SWCNTs. The newly proposed mechanism was based on the Lab's competences on the studies of the mechanism of GO formation of graphite that involves three consecutive steps: (a) intercalation of graphite by sulfuric acid with formation of a stage-1 H2SO4-graphite intercalation compound (GIC); (b) conversion of stage-1 H2SO4-GIC into pristine GO, and (c) exfoliation of GO to single-layer sheets upon exposure to water. Thus, under given conditions, formation of stage-1 H2SO4-GIC is unavoidable for any graphitic material. Subsequently, the mechanism of the oxidative unzipping of MWCNTs might be also intercalation-driven. If this is correct, one should be able to stop the reaction after the first intercalation-unzipping step before the second oxidation step proceeds. If attained, this will afford unzipped but not oxidized or minimally oxidized products possessing properties similar to reductively unzipped GNRs obtained by potassium or sodium-potassium metal intercalation. In this work, the Lab investigated the impact of the two key parameters, the KMnO4/MWCNT ratio, and the time of reaction on the structure and composition of as-obtained GNR products, and derived a revised and more complete understanding of the unzipping process. The researchers demonstrated that the mechanism of the oxidative unzipping of MWCNTs is indeed intercalation-driven. The overall unzipping process involves the same three steps as in the course of GO production from graphite by the Hummers and modified Hummers methods: intercalation, oxidation, and exfoliation. With MWCNTs, the intercalation is associated with simultaneous unzipping. At low KMnO4/MWCNT ratios, one can obtain GNRs with characteristics similar to those produced by reductive unzipping. 0.12 wt equiv KMnO4 is the threshold ratio sufficient for almost complete unzipping, with only small amounts of covalent oxidation. Controlling the KMnO4/MWCNT ratio and time of reaction allows one to produce GNRs with the properties varying in a broad continuous range from multi-layered graphenic GNRs through single-layered GONRs. Thus, the team answered several questions that remained open in the field of unzipping MWCNTs, such as the reason why the inner-most walls of the nanotubes remain zipped. The intercalation-driven reaction mechanism provides a rationale for the impossibility of unzipping single-wall and few-wall CNTs, and aids in a reevaluation of the data from the oxidative unzipping process. 1. Kosynkin, D. V.; Higginbotham, A. L.; Sinitskii, A.; Lomeda, J. R.; Dimiev, A.; Price, B. K.; Tour, J. M. Longitudinal Unzipping of Carbon Nanotubes to Form Graphene Nanoribbons. Nature 2009, 458, 872-876. 2. Rangel, N. L.; Sotelo, J. C.; Seminario, J. M. Mechanism of Carbon Nanotubes Unzipping Into Graphene Ribbons. J. Chem. Phys. 2009, 131, 031105.